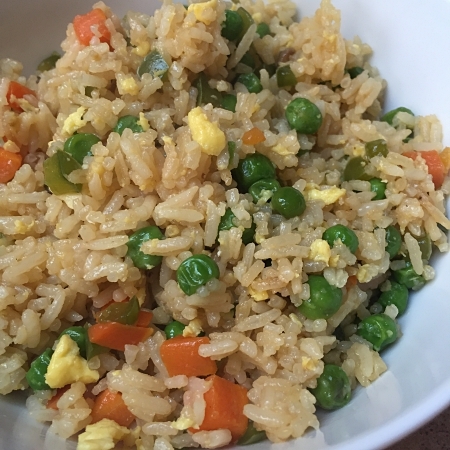 This is a super easy and cheap meal that I like to make when I have leftover rice! Heat the oil in a wok or deep skillet over medium-high heat, and add the ginger, garlic, carrot, pepper, and mushrooms. Cook for a couple of minutes, stirring constantly to avoid burning the garlic. Add the rice, peas, and soy sauce and stir to combine. Move everything to the side of the skillet, and pour eggs onto the other side (add more canola oil if necessary). Cook until eggs are scrambled, and stir into rice mixture. Makes 4 servings.